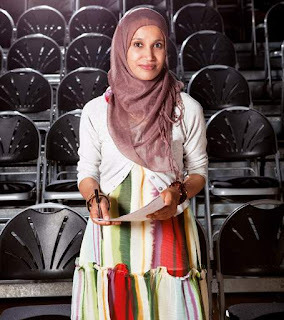 The writer and campaigner Rabina Khan talks to Charlotte Kemp about her drive to dispel the myths and stereotypes about the hijab, and how her latest project, which documents the views of Muslim and non-Muslim women on the subject, is helping to promote a new understanding. With her beautiful face framed by a dusky pink headscarf, Rabina Khan arrives at our rendezvous in east London a slight and seemingly shy figure who looks no more than 20 years old. But as if to prove her mission to challenge people’s perceptions of each other, all is not quite as it seems. For in fact, not only is Khan 37, and married with two daughters, aged 15 and nine, she is far from shy, exuding a calm confidence which pervades her work as a novelist, editor, campaigner and general champion for Muslim women’s rights both in Britain and around the world. There are more surprises. Though she now thrives in the ethnic diversity of London’s East End, she was born in Bangladesh but grew up in the predominantly white town of Rochester, Kent, in the south-east of England, less than 10 miles from my own childhood home. Finally some good books on the topic, written by a Muslimah. I'm always looking for books on hijab, not only women's experiences and choices, etc. but the politics of the hijab. Rabina Khan appears to have done it and I look forward to reading her books. JazakAllah for opening the doors to people's minds.